Built when Graz was named Cultural Capital of Europe 2003, the Kunsthaus Graz is situated in a less privileged district of the city, adjacent to the historic city centre. It was built on a vacant lot, directly adjoining the ‘Eiserne Haus’. Once a modern, mid-19th-century department store, the building was gutted and linked to the Kunsthaus. The listed façade and its cast-iron structure on the upper storey were preserved. The blue shimmering ‘bubble’ of the new building floats above the glazed ground floor like an air bubble. Its soft forms fuse organically with the older buildings on the adjacent lots. The BIX-media façade by realties:united, actually the outer skin of the building, communicates and interacts with its urban surroundings. Through the changing programme it plays, the BIX emphasises the organically formed nature of the building. The Kunsthaus can be entered from all sides. Its multidirectional foyer holds a conference space, a shop and café. Conceived as a multi-disciplinary venue for exhibitions, projects and performing arts, the Kunsthaus Graz provides a complex palette of spatial features and functions. On a 30-meter-long travelator known as the ‘pin’, visitors can penetrate the skin of the mysteriously shimmering bubble, cut through the area designated for children and young people (space03), and land at the level of the first exhibition area (space02). 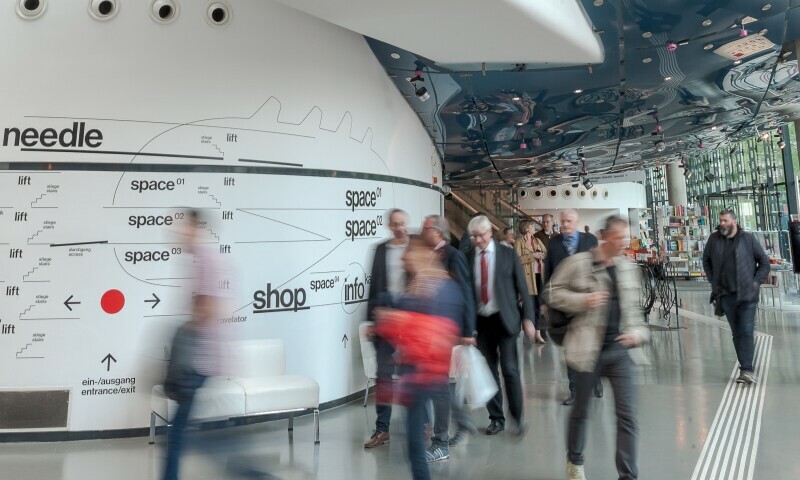 A second travelator takes visitors to the upper exhibition deck (space01), with its impressive structural shell, 8 meters at its highest point. The exhibition area is equipped with adjustable daylight and artificial light sources, the cones of the nozzles giving the inner surface of the building’s skin its distinctive structure. One of them frames the famous Schloßberg with its clock tower and the impressive roofscape of the old town across the river. The visitors leave the ‘bubble’ and enter into a remarkable cantilevered glass structure: the needle. An unforgettable view of Graz and comfortable seats create an atmosphere for relaxation and reflection, for public readings, plays, sponsorship events and small private occasions. The Kunsthaus Graz is an exhibition space for modern and contemporary art that collaborates with institutional partners worldwide and connects with local initiatives and institutions. It promotes and imparts visual and performing art, liaises with architecture/design, and commissions new artistic productions—reflecting and responding to current changes in global politics and economies. Particular emphasis is placed on the conditions of institutional, curatorial and artistic production, drawing attention to conflicting concerns and interconnected processes of negotiation. The Kunsthaus does not have a collection of its own but—as part of the Universalmuseum Joanneum—regularly presents artworks from the museum´s departments in its international exhibitions. Exterior photo, banner: Kunsthaus Graz, bird's eye view, Photo: Zepp-Cam. 2004/Graz, Austria.